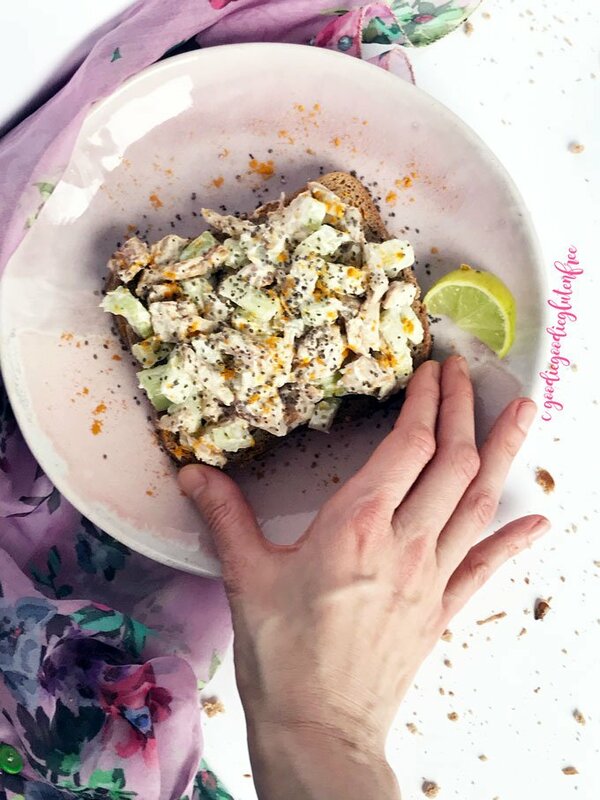 Creamy and Clean Superfood Chicken Salad Toast recipe for the win! 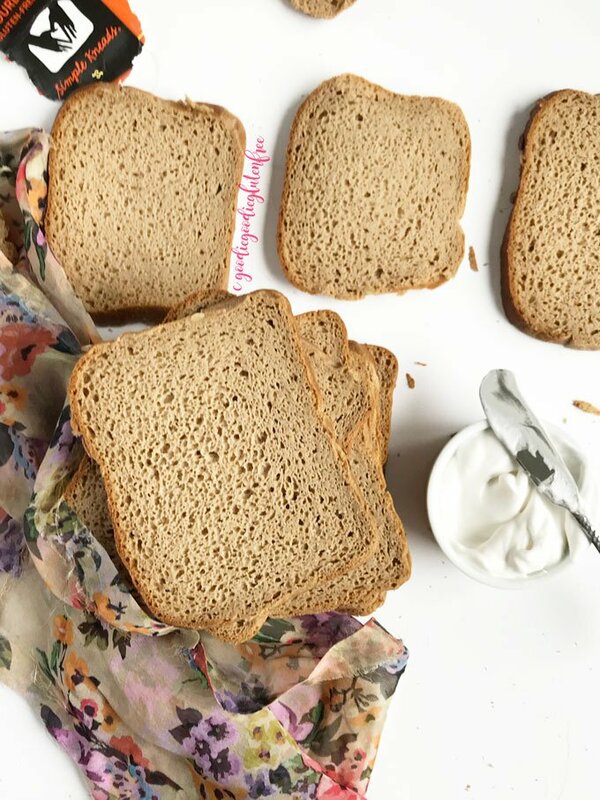 Made with the creamiest gluten-free and dairy-free clean ingredients on the best gluten-free sourdough bread of all time! Tastes like it used to taste, ya know before going gluten-free? Yeah, it’s THAT good. What do you do when you have leftover chicken and no idea what to make for dinner? I know this happens a lot! What do you do when the last thing you want to do is be the cook but you are starving? Ordering out would take at least 30 minutes, if not more, and in that time if you made your own food it could be done well before that 30-minute marker. What do you do with your leftovers when throwing them out seems wasteful? What do you do when you only have a few tablespoons left of your yogurt and not enough for a whole yogurt breakfast? 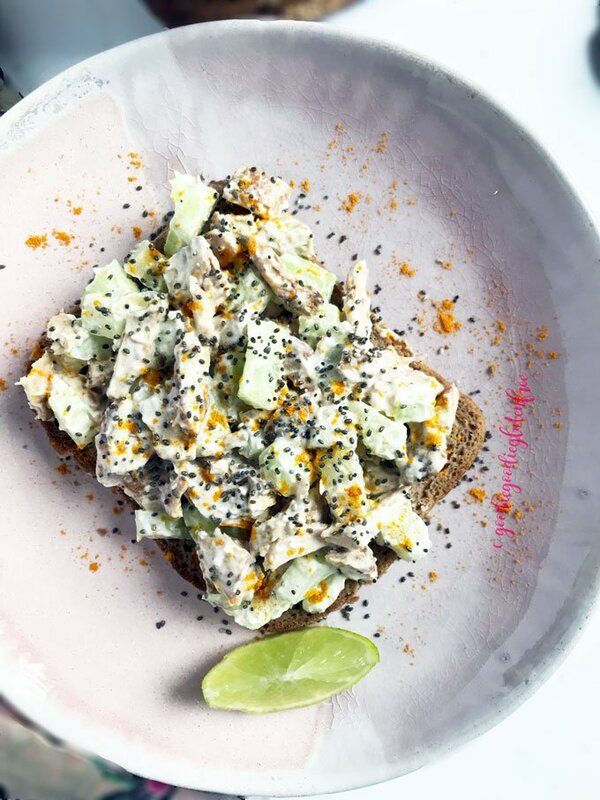 Coconut yogurt chicken salad with crunchy celery and a sprinkle of turmeric is the best chicken salad on the planet!! 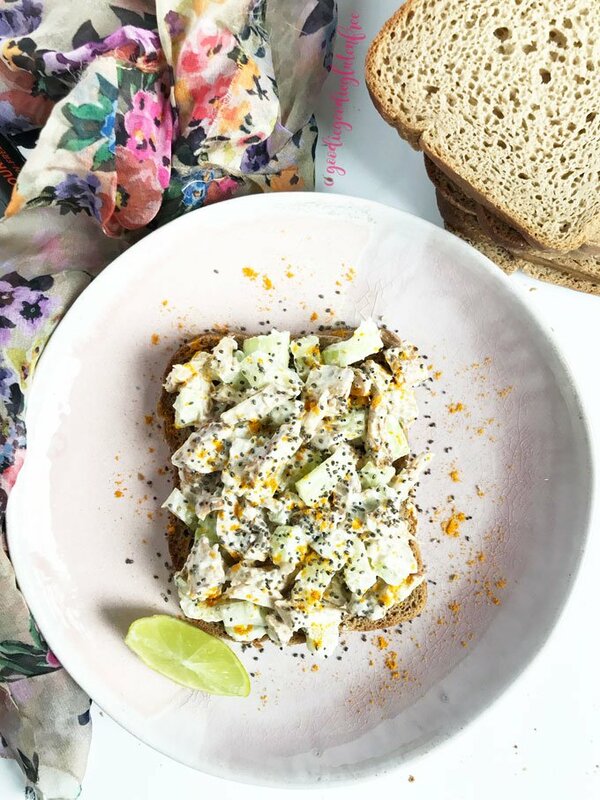 Plus if you use a hearty gluten-free bread like Simple Kneads Sourdough well then you’ve got yourself a healthy and nutrient-dense meal. This is how you take leftovers and make a genius meal. It’s creamy and totally dairy-free. This yumminess is crunchy from celery rather then tree-nuts or peanuts. Action packed protein with shredded chicken. Full-fat coconut yogurt keeps you full and satiated! Shred chicken breasts into a bowl with your hands and get messy if you need to. Add herbs to the chicken once shredded and mix together so that the herbs are evenly spread into the chicken. Massage unsweetened coconut yogurt plus the fresh lime juice into the shredded chicken making sure the chicken is covered in the yogurt. Add in celery and massage/mix again. 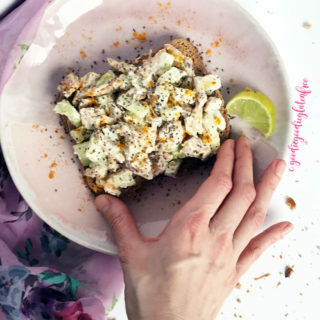 Add the chicken salad to your gluten-free bread (toasted or untoasted). Then top with a sprinkle of Turmeric. Serve open-faced or as a sandwich. 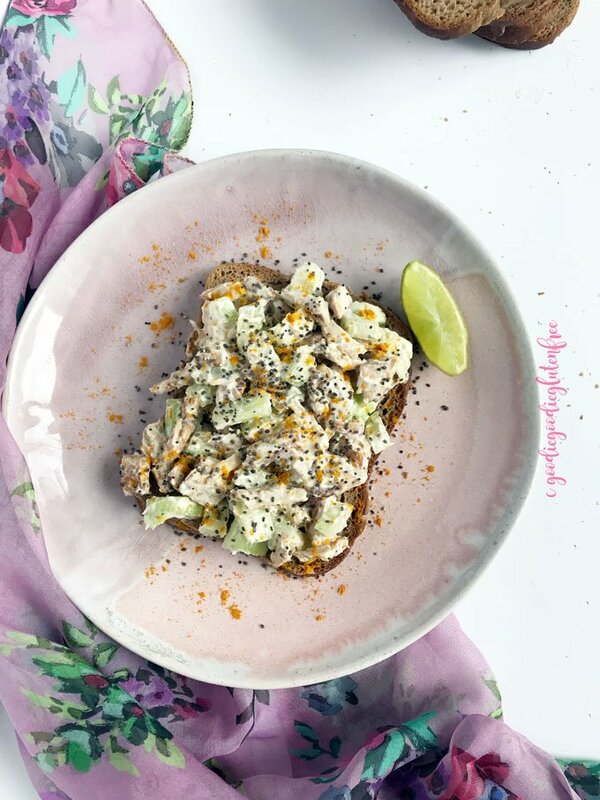 Creamy and Clean Superfood Chicken Salad Toast recipe for the win! 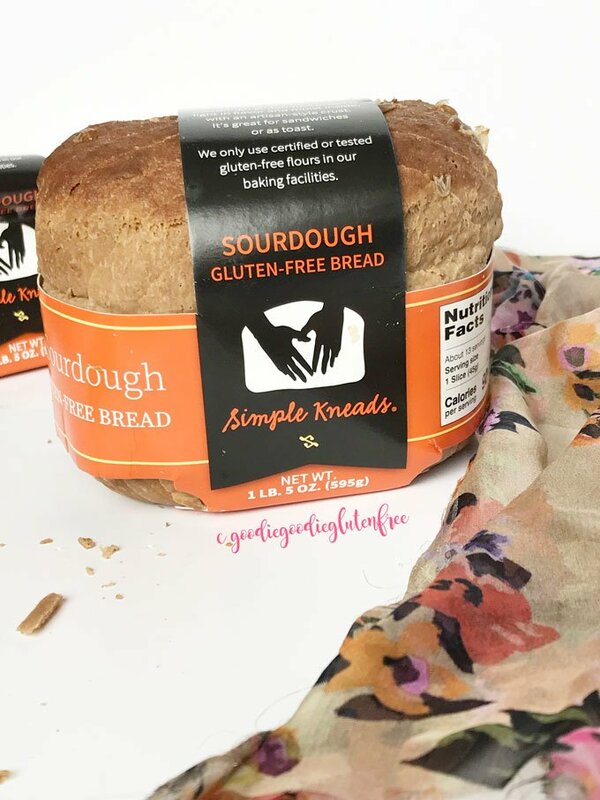 Made with the creamiest gluten-free and dairy-free clean ingredients on the best gluten-free sourdough bread of all time! Tastes like it used to taste, ya know before going gluten-free? Yeah, it's THAT good. 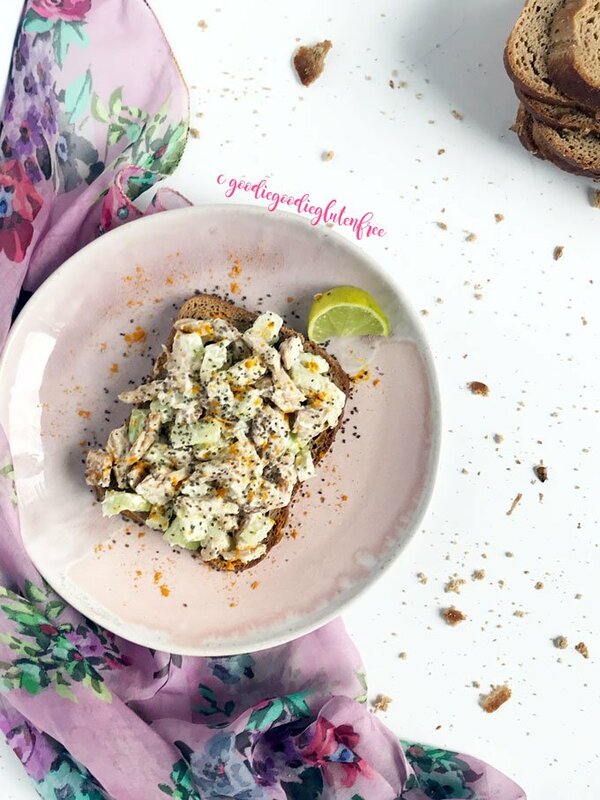 Add the chicken salad to your gluten-free bread (toasted or untoasted). Then top with a sprinkle of Turmeric.